The 4BT engine is inline four-cylinder water-cooled turbodiesel engine in the Cummins B series. The 3.9-liter strait-four together with 5.9-liter straight-six (12 valve Cummins) are the most popular engines in B series. There are 3.3-liter and 4.5-liter four-cylinder engines also available. The engine has cast iron engine block with engine bores machined directly into the engine block. All 4BT engine blocks are the same, and they have a different transmission adapter plate only depending upon the application. The engine valvetrain is OHV. A camshaft is mounted into the block and driven by crankshaft through gears in the front end of the engine (as well as oil pump). The camshaft opens and closes valves pushing through rocker arms by pushrods and solid tappets. The cylinder head is made of cast iron too. The intake and exhaust ports are on opposite sides (crossflow cylinder head). There are eight valves, 2 per cylinder. The 4BT features the mechanical direct injection system. The early versions equipped with the P7100 mechanical injection pump driven through a gear by camshaft’s gear. The 4BT engine has the turbocharger, but it is not-intercooled. Intercooled version (named as the 4BTA, where letter A means “Aftercooled”) has lower compression ratio 16.5:1. Lower compression and cool air allow giving a higher boost. The 4BTA engine produces more power and torque and is more suitable for installation in a small truck or pickup, but keep in mind what the 4BTA is an industrial engine. Automotive charge air cooled engines have different numbers depending upon model and year of production. There is the industrial naturally aspirated version named as the 4B with 18.5:1 compression ratio also available. The 4BT is very similar to the 6BT. It has the same architecture, and many parts are interchangeable. The pistons, injectors, connecting rods, valves, pushrods, and rocker arms are identical. The 4BT is a smaller displacement and shorter in length four-cylinder version of the 12 valve Cummins engine. The 4BT is not inherently balanced like the six-cylinder 6BT engine, so it produces a lot of vibrations, and so smooth in operation compared to the 5.9-liter Cummins. The 3.9-liter Cummins was the popular choice for many commercial step van applications (Chevy Step Vans for example), including bread vans and other commercial vehicles. 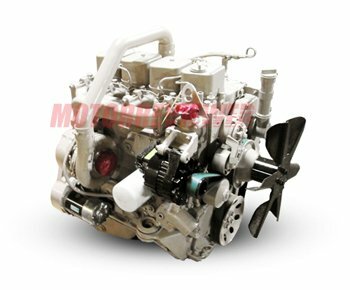 The 4B engines were commonly used in industrial equipment such as power units, drilling machines, big water pumps, wood chippers, etc. In our day it has massive popularity as engine swaps in Jeeps, Dodge pickups, and smaller trucks/SUVs. The 3.9-liter engine was widely used in different applications, that means it can be found easily and for a meager price. The B series engines require very few electronics, and they are cheap and straightforward to rebuild or repair. The P-pump engines are more comfortable to modify, and more reliable compare to modern electric VP pumps. But the fact is the 4BT is old, massive diesel engine. It is noisy, shaky, smoky as an old diesel. The engine is quite difficult to install under a hood of a small vehicle due to large dimensions, it is tall and weight so much, also need a place for an intercooler and pipes. It is not enough power for a full-size truck or SUV, at the same time its weight puts more strain on a front suspension and make an adverse effect on the handling of a small 4x4 vehicle.